Last year I posed the question of Bedfordshire's place in regional history - midlands, eastern counties, home counties, etc. A book from English Heritage has just come my way, although published in 2006, that answers that question by placing the county firmly in the East Midlands. It draws upon topography, forests and hills, settlement patterns, weather and agriculture to define the East Midlands region as running in an arc southwest from the North Sea coast of Lincolnshire to west Oxfordshire. At its eastern and southern boundaries it excludes the Fens and the Chilterns, thus including the majority of Bedfordshire firmly within the region. The exception is those extreme southern parishes at the intersection of Beds, Bucks and Herts, which fall within the South East region and the outer limits of the pull of London. The book is a sweeping survey of climate, communications, settlements, housing, industry and religion over several millenia. Despite this wide sweep, there is much to interest and instruct the historian of Bedfordshire, not least the importance of placing a county in its wider geographical context. The maps, diagrams and photographs illustrate the text superbly. David Stocker, England's landscape: the East Midlands. Collins for English Heritage, 2006. 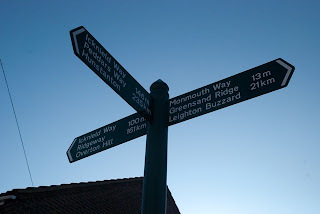 Above: a signpost in Toddington, Bedfordshire. 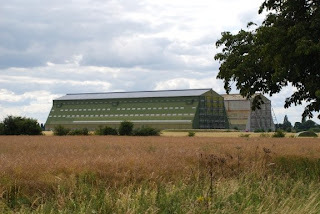 Right: Airship hangers at Cardington - a bit of modern landscape.